I bought a little chair for Lorelai to use at our house. 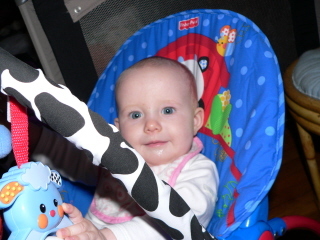 It's by Fisher Price and the nice thing about it is that she can use the chair when she's a toddler. 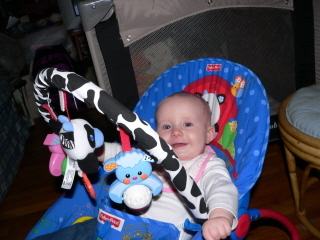 The toy bar is cute and she really seems to enjoy it. It just makes it really hard to take a picture of her in the chair! It kept her busy for a little while. After all, this is a girl who's used to being entertained by the acts on stage at the theatre. Ok, I came up with a plan for the sweater. I'm not taking the first sleeve out until I see what happens with the second. 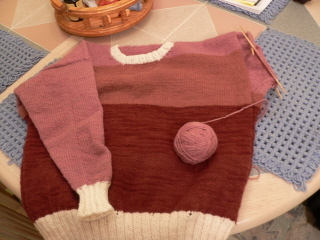 If, indeed, I have enough yarn to make the sleeves I want, I'll redo the first. If by chance, I'm not going to be able to do it, I'll be able to start the second again and match the first. I knew this would be a crapshoot so I'll just remain optimistic about it. 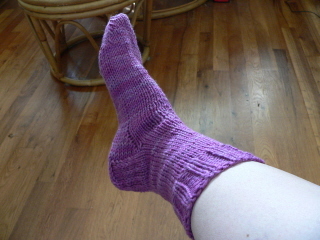 The purple socks are done and I love them. I've already started another pair in green heather. Also, I took Lorelai for a ride to the craft store on Sunday (where we faced the rain, Lorelai stayed dry in her stroller and Nana walked through puddles in flip-flops. Hmmm) and discovered that wool ease yarn was on sale for $1.99. Be still my heart. I did some serious damage and now have lots of lovely colors for socks and other fun projects, such as a poncho for Kelly. I've been enjoying working on the sweater but sometimes, it's hard to tear myself away from the socks. They're so fast (the worsted weight are, anyway) and it's fun to see something finished quickly. The longer projects, of course, are fun when you see them take shape. We have a busy weekend coming up. I'll bring the camera and try to remember to take some pictures. Where did the summer go? I feel like I was sick or hurting through most of it. Now, that's annoying. 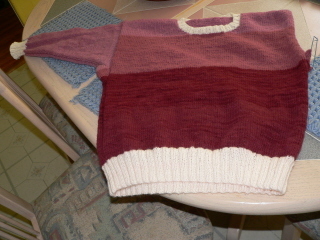 I've been looking at the sweater (pictured below) and thinking. Hmm. Since I have more yarn than I anticipated, I'm seriously considering ripping out the sleeve and redoing it with more room. I love this sweater and I'll love it more, or continue to love it equally, if the sleeves fit better and are as roomy as the rest of the sweater. I'm going to work on the pattern and see what I can do. do you not love this sock? I'm in love with this yarn and I think it's necessary for me to take another trip to Wild and Wooly Wools to pick up more. This is the incredibly lovely 100% merino wool, hand-painted yarn I mentioned. Yes, it's a very pretty purple. This is a great sock pattern, very fast. I made half this sock in the car on the way to Hershey. More on that later. 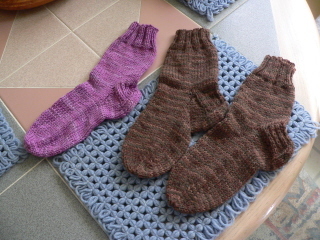 Here's the cute purple sock alongside the brown variegated socks I finished late last week. This is the same pattern. This yarn is wool ease, one of my favorites. It's a wool/acrylic blend and very soft. 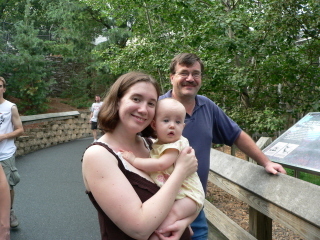 This past Saturday, Bill and I took Kelly and Lorelai to Hershey, PA for the day. It was Lorelai's first road trip and she visited two states. She handled the trip well, even though she spent hours in her car seat. She only got a bit testy toward the end, when we were almost home. We visited Chocolate World, which Kelly said is more "blinged up" than it was when she was little. We also visited ZooAmerica. It was hard to point out the animals to Lorelai since they're in habitats and are often difficult to see. It was also very crowded. We had ice cream sundaes at Chocolate World, lunch at Cracker Barrel (of course) and dinner at a family style restaurant in Hershey, where we bought a shoe fly pie to bring home. Yum! 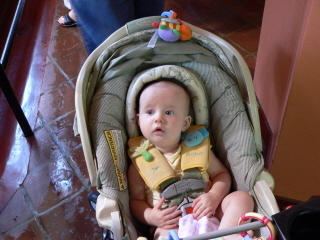 Lorelai in her stroller at the zoo. When we planned to go to the zoo, it started to rain briefly so we went to the outlet stores to wait out the weather. We went to a Carter's outlet store and Lorelai went home with a fall wardrobe for a song! That alone was worth the trip. We also found a few toys to keep her busy on the way home. Yesterday, the weather was just awful. It went up into the high 80's with the humidity to match. Ugh. It seems better out there today. Well, time to get to my chores. It's Monday, the weekend's over and I need to clean up this house. Can I get Pooh to help me with my chores?? One sleeve is done. Honestly, I would have preferred the sleeve to be a little more roomy but I did it this way because I was afraid I wouldn't have enough yarn. It's fine but next time I use this pattern, the sleeve will be wider. Still, this sweater is shaping up nicely and it's really nice to be able to try on the sweater every time I finish another section. That's fun! It's warm and comfortable. I'm taking a break before starting the next sleeve to work on a sock. I've been working on this sweater exclusively for the past month and a half, I think. Not only is my throat still sore but I now have an eye infection, which means that even though Kelly and Lorelai were here tonight, I couldn't hold the baby. :-( That's not fun. I have a doctor appointment for Monday afternoon, which means I'm living with this infection, and the sore throat, for the weekend. Sigh. p.s. 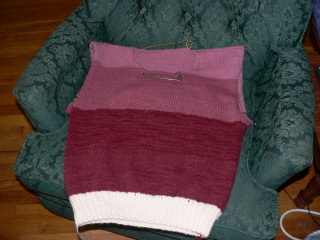 I'm thisclose to finishing the sleeve on the sweater but I may not have much time in the next few days. We're interpreting South Pacific on Thursday evening so I have to study the script.....and get better! I have this problem. I can't just sit. I always feel I have to be doing something constructive, even if I'm relaxing, or I feel guilty. In fact, I won't sit down, relax and do something I enjoy until all my chores are done. Some lessons from childhood really stick with you, I guess. I think that's why I don't watch much TV anymore, other than the fact that the choices are so overwhelming and after reviewing the choices, there's nothing all that interesting, anyway. But, I do feel like I should be doing something. So, when I don't feel well and I don't feel up to doing all the chores I do everyday, I still feel like I should be accomplishing something. 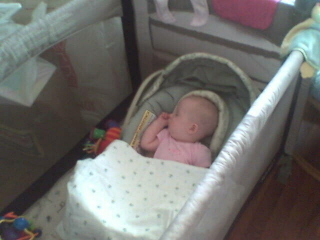 Since Friday, I've been feeling sick, having caught Lorelai's cold. In fact, everyone who cared for her caught Lorelai's cold. Since catching the cold, I've felt sorry for the poor baby. This one's nasty. My throat hasn't been that sore in a long time. I understand why she was so miserable. Anyway, I've been resting on the couch and knitting. Knitting is therapeutic. It's soothing, restful, almost meditative, except when you're learning, but that improves with time. I've been taking pictures of the progress but wasn't in the mood to post anything here. 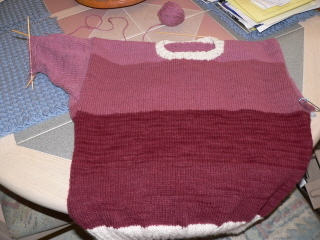 I'm feeling better today, finally, so here's the sweater, taking shape. First, I finished the front and joined the shoulders. 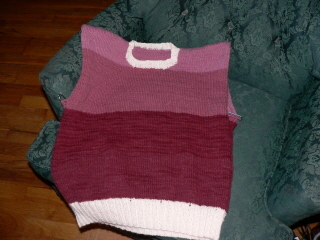 Next, I picked up the stitches around the neckline and knit the collar. It's only an inch so it didn't take long. As of today, I have the right sleeve half finished. I thought I might not have enough yarn to finish a whole sweater but I think I might have some yarn leftover. I guess I could have done the ribbings with the hand-dyed yarn but it wasn't worth taking the chance. 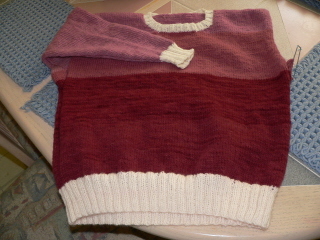 I like the look of the sweater, even though I tried to conserve yarn as much as possible by just continuing with a color until I ran out. In a way, it's a color-block sweater that is becoming what it wanted to become. It was an experiment that will end up keeping me warm. Pretty cool. If I use this type of yarn again, I think I might try stripes, especially if I use the same pattern, and I know there will be enough yarn to complete the sweater. After I finish this, I have some socks to work on. I have one sock started with beautiful hand-dyed 100% merino wool, the softest wool I've ever felt. 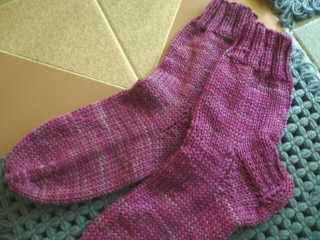 Then, I have three socks done that need another sock to match. If I work on that, I'll have several new pairs of socks for the fall and winter. I'd like to do some for Christmas, as well, and I also have to make a Christmas stocking for Lorelai. I have some patterns and I'm trying to decide which I'd like to use. At least I feel like I accomplished something while I was out of commission here. Bill said I have to get better because "the house just isn't the same when you're sick". Yeah, I said, it gets messy. Hope everyone out there's healthy. How Eeyore feels when he's sick. 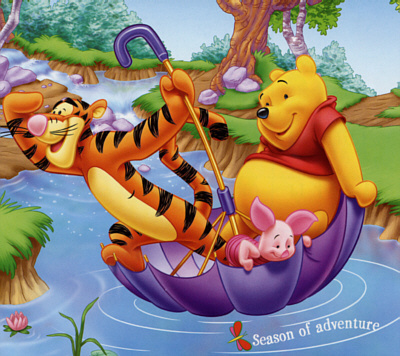 Pooh, Tigger and Piglet really should jump out of that umbrella and soak in that river since the temperature is ridiculously hot for 10:30 in the morning. It's 90 degrees already. It was 91 when I came home from class last night at 9pm. It's heat of biblical proportions. I don't know what the means but it sounds bad. Lorelai is recovering from a nasty cold, the first she's had. She has a bad cough and, according to the doctor, a very raw throat. Poor baby. She's over the worst of it, though, and had a nice nap on Grandpa yesterday afternoon. 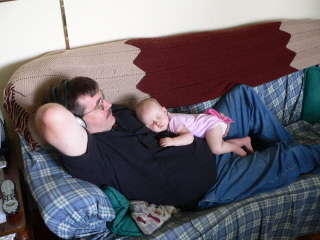 Grandpa was watching a movie with headphones so the sound would not disturb the sleeping baby girl. 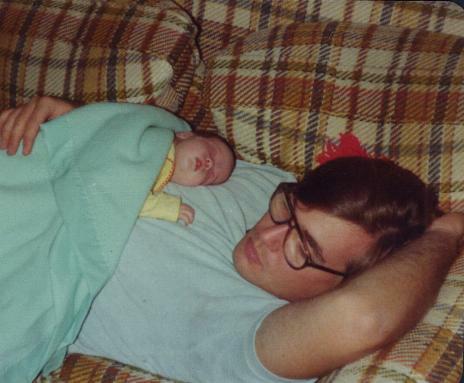 Hmm, this picture bears a striking resemblance to a picture of Kelly with her Dad. Some things never change. 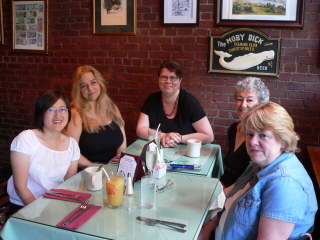 Jan and I had a nice visit in Poughkeepsie this past weekend. 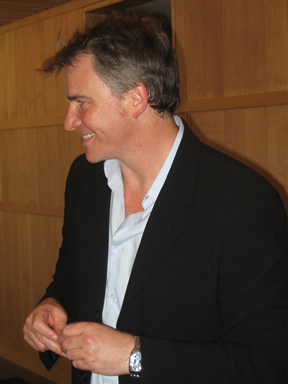 West coast and east coast fans converged on upstate NY and Vassar College to see Douglas in the reading of Jerry Christmas, which is about a Jewish comic/actor (I guess like Jerry Lewis) whose latest movie has flopped. The producers won't let him make another movie. They say he's too Jewish and that alienates his audience. So, they come up with the idea to have him do a traditional Christmas TV special with his family. His wife and kids, naturally, aren't too thrilled with the idea but they go ahead with it, with disastrous results, of course. It's very funny. The cast was really great, including Adriane Lenox (Tony winner for Doubt), who played their maid, Zaephronia. She was amazing! The other standout was Jessica Stone, who played the daughter of the producer of the special. She was promised a part in the show and winds up singing a hysterically off-key performance of O Holy Night. I think with sets, movement and all the bells and whistles, this could be a really funny show. The composer is Andrew Lippa and the book was written by Daniel Goldfarb. I didn't realize Andrew Lippa was so young! The music, by the way, is great. The songs are catchy and clever. And, of course, Mr. Sills had a great time with this part. It gave him the opportunity to sing and be funny and manic. The man of the hour, courtesy of english. 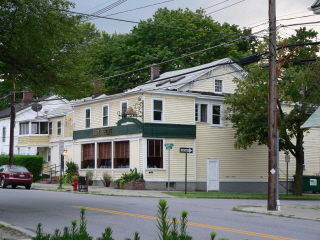 The Busy Bee Cafe, where we had dinner Saturday night. It's in an old house and the food was wonderful. The unisex rest room was cool, with the bathtub still there. That was interesting. 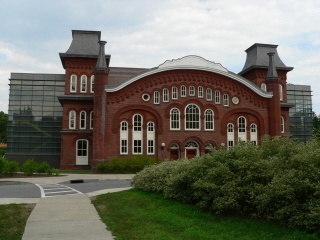 The Martel Theatre on the grounds of Vassar College. 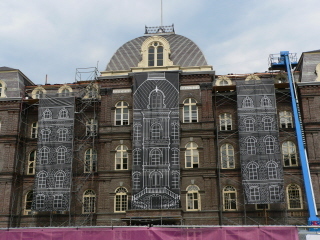 The Main Building at Vassar, with renovations to the tile roof in progress. This building was built in 1861, with very wide hallways so that the ladies could walk for exercise through the halls in their hoop skirts during the wintertime. 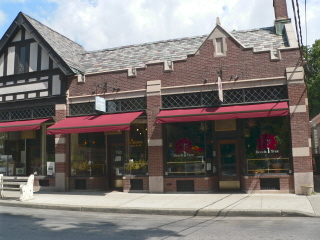 Brunch was at the Beech Tree. Both restaurants were found by Kazumi and both were excellent! 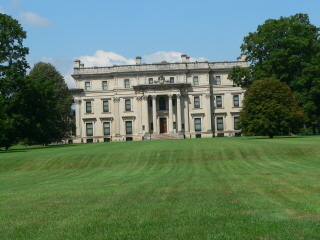 Jan and I took a brief drive Sunday morning before brunch, visiting Hyde Park and the Vanderbilt Mansion (shown above). We didn't have a lot of time so we couldn't take tours but we walked around the grounds and visited the gift shop at Hyde Park. 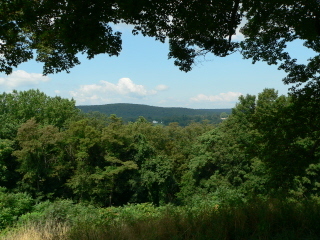 Here's the view behind the Vanderbilt Mansion. 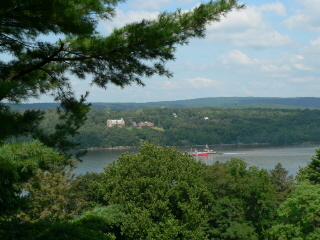 The Hudson is behind those trees in the front of this picture. A better view, with the Hudson. 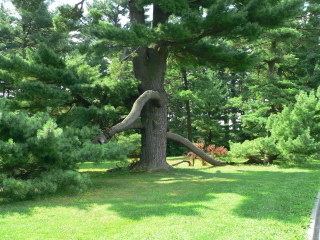 Jan and I were intrigued by this tree on the Vanderbilt property. It appears to be a kind of pine but the branches looked as if they'd fallen but were still growing. Really interesting. We had a good trip and all our companions arrived home safely. Now, if the temperatures would cool, all would be right with the world!